Steven Seagal is a ghost. No, I don’t mean the ethereal kind that’s difficult to see. It’s hard to imagine him waddling down the street with his goofy black ensembles and strange glasses with the orange-colored lens he insists on wearing in all his movies now and not be spotted a mile away. He’s a ghost in the intelligence community sense that he isn’t supposed to exist. He even tells his police department buddy that he’s supposed to be undercover and when his pal wants to know what he’s doing undercover, Steve rightly responds that it wouldn’t be much of an undercover gig if he went and told him. But he not only intervenes and kills a stripper’s boyfriend when he’s abusing her, but also just sits around at an outdoor Parisian cafe the next day waiting for her and agreeing to her greedy scheme to steal her dead boyfriend’s drug money. It’s really the sort of thing that makes zero sense anywhere except in a Steven Segal movie, where you would be shocked if it didn’t happen. Much time is spent by Steve’s character Decker and stripper Lisa plotting the theft of the money. It’s complicated because the car is currently at the police impound lot and Decker assures Lisa he has a plan and even shows her a real police badge he has that’s part of his plan. Things could go a little haywire with this crazy plan of his so he makes Lisa assure him that if things go sideways she won’t lose her head and she’ll keep playing along with him. I couldn’t wait to see what sort of hair raising, edge of your seat scheme which required split second timing and a generous helping of luck he had up his sleeve. Heck, I was thinking that even Tom Cruise was probably paying attention to get ideas for his next Mission Impossible movie! Steve did not let us down! And by that I mean he simply went full Steve on the impound lot and its crew. You remember the badge he famously showed Lisa that was part of the plan? He actually used it like he said he would! He showed it to the on duty cop guarding the impound lot and when the guy looked at it, Steve beat him senseless, then ambled over to the car, took the money and left! But he also encountered another guard at the impound lot! He had a plan for that, too! He kicked the guy off the third story of the impound lot! You know why Seagal will never be in an Expendables movie? Because if he was, what would all the other Expendables do after he got done doing everything by himself? Vargas orders his man in Paris, Gage, to recover the money. When Gage advises Vargas that the man with the money just also happens to be an ex-DEA agent from Texas, Vargas doesn’t even care. The film plays exactly like you would expect with Gage tracking down Lisa with improbable speed and then forcing her to call Decker to set up an exchange of the money for Lisa. Decker knows it’s a trap so he enlists his cop friend to come along as his sniper backup, rigs up a fake money bag full of explosives and then talks smack to Gage for a bit before it all goes gloriously sideways. A stripper is going to do what a stripper is going to do and as Decker’s friend says, the only thing a stripper wants to see come out of a man’s pants is his money, but this is a Seagal movie, not a stripper movie, so it’s no spoiler to say the film ends with Lisa suffering a bad case of a bullet wound to the head while Decker and the policeman banter back and forth on the way to ER to get the cop’s own gunshot wound treated. 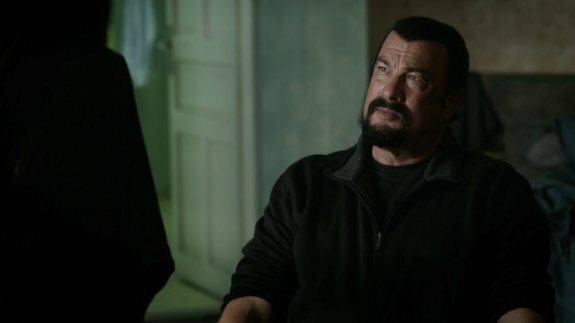 Shot using the same director and several of the same cast members as another one of Seagal’s numerous 2016 movies, Killing Salazar, this film at least feels totally different than that one. 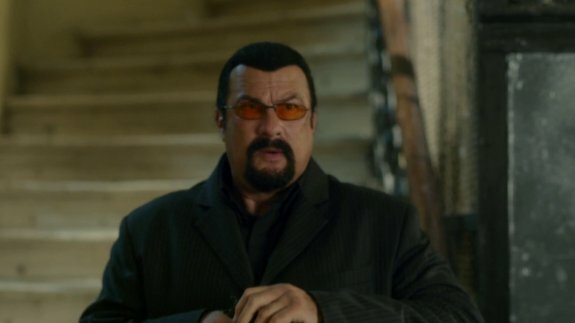 After a number of films where Seagal is barely involved in the story, but still involved enough to make the movie terrible, he’s the straight up leading man here. 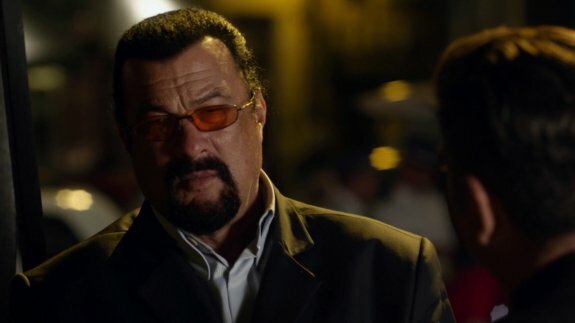 Even more surprising is that so much of what makes a modern day Seagal movie what it is, is dialed way back in this one. Silly dialogue is limited to a few voiceovers and a not too over-the-top speech about honor at the end of the film. The story is one that you can actually follow, a simple “stolen money leads to trouble” plot with no twists, instead of the convoluted double-cross laden efforts that only end up seeing Seagal kill everyone in the end anyway. 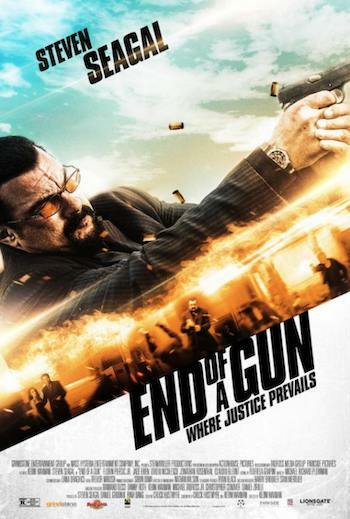 The most surprising thing though about End of the Gun is how much you miss all that uniquely weird Seagal stuff once you’re forced to endure him glumly grinding his way through what would be a dull thriller even without him and his limitations (distractingly strange physical appearance, unconvincing stuntwork, difficulty emoting in a manner resembling a human being). Just to give you a sense of what you are in for, after he kills the stripper’s boyfriend at the beginning of the movie, it’s at least another half hour until he even starts beating people up again! It’s enough to give us raging Seagalaholics a bad case of the DTs!